How about diamonds? Our talented jeweller can add stones to most eyeglass frames, making your eyewear truly unique. Choose from white or colored diamonds, sapphires or rubies. For 35 years master artisan Fred Curtis has been creating exquisite jewelry for discerning customers around the world who demand the level of attention to quality and detail that is his hallmark. Working with clients from the fashion, music and movie industries he creates beautiful one of a kind pieces drawing on his knowledge and passion for Swiss and German techniques. Fred's love for jewelry started when he was a toddler and that same passion still fuels what he does today. His work is never mass produced or compromised by inferior materials as onoly the finest precious stones and metals are used in his creations. Fred loves being a part of such a unique and professional team as Salle Opticians. Salle Opticians has it's own in house finishing lab, producing all our lenses, therefore we can custom design a shape in almost all of our rimless frames to ensure you get exactly what you want. 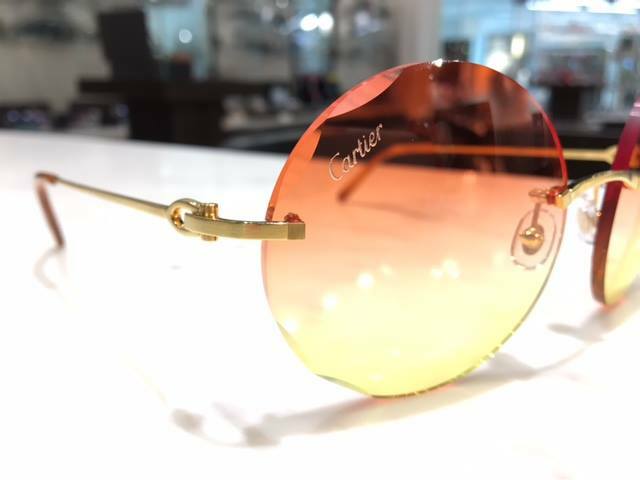 The most popular collections for this type of customization are Cartier, Swiss Flex and Gold and Wood. We are also the only certified Swissflex store in the United States, having been trained exclusively in Berlin. We can also tint your lenses as desired with almost any color. The options are endless! Facets are an option that are popular today, adding a distinctive touch to your lens. Custom engraving? No problem, we can customize logos on almost all lenses. If rimless frames are not what you are looking for then how about Schnuchel? These acetate frames have a full range of colors from fabulous tortoise shells to bright red or blue. We can customize the size, shape, temple length and color. For a truly bespoke eyewear experience we can offer customizable buffalo horn frames from Tom Davies of London. This material offers a truly luxurious look to your eyewear. Difficult to fit bridge? We have the ability to customize nose pads for your acetate frame. This ensures your frame fits well, doesn't slip and keeps them off your cheeks. We can do this in-house, usually the same day. Sunglass clips are a very popular option for many glasses wearers. These clips can be custom matched to your frame for a perfect fit. Available in polarized or non-polarized lenses.